After my research, I found this project in which I really put my faith: ALIVE CASINO. Very likely you haven’t heard about them, project is made by great team members. Nevertheless, guys have an advantage, many other teams does not: already existing product made on a very perspective field. But these are not all pluses I found in this project. Below you can read the analysis and decide on your own, do you want to send some pennies to the pot. Alive Casino is the first cryptocurrency casino in the world that integrates virtual reality technology. In addition to our traditional online gaming options, Alive players can enjoy live games in HD and VR videos. The main goal of Alive Casino is to act in such a way that online casinos occupy a large share of the gambling market. This goal will be achieved through two key strategies: first, following only transparent practice, mainly thanks to Blockchain technology, and secondly, providing real human experience for online players through effective social networks and the experience of gambling in VR. ALIVE CASINO aims to change the way you view the casino ICO and online gambling in general. The world’s first blockchain-VR casinos also integrate traditional online games, Alive ultimately brings transparency and accountability to the online casino world. The key to Alive’s openness lies in the integration of the blockchain, the effective implementation of social media and – perhaps most importantly – its decentralized business structure. The initial casino development will be funded through the sale of security tokens – Alive tokens. 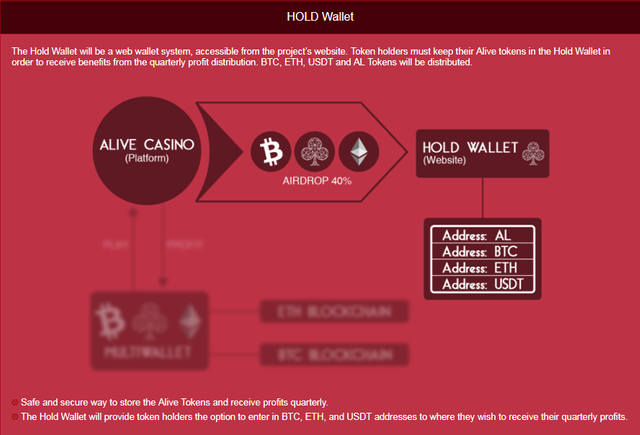 The use of blockchain technology within the framework of the Alive Casino platform will provide a very high level of security, solve problems with fraud or hacking your account. Payments will take place almost instantly, as there will be no intermediaries in the form of banks or payment systems. Absolute transparency of all transactions when using smart contracts. The completion of the purse is quick, this can be used as the means cryptocurrency and Fiat. One of the features of the Alive Casino platform will be the presence of live dealers. This is a unique experience that allows you to enjoy not only the process of the game, but also to communicate with the dealer in real time through a live broadcast. Dealers of Alive Casino make efforts to make the game take place with comfort and safety. They strive to become true friends for every player and will be available through social networks, where you can communicate with them outside the virtual casino platform. Alive Casino offers an unprecedented form of entertainment, when the player can be in a virtual casino with all its charms in the company of other players, that is, digital avatars, while he can be at home or anywhere he wants. Because Casino Alive will accept payments by electronic money, the distribution of profits will be made according to each currency in a corresponding way. BTC, ETH, USDT and AL notices will be distributed quarterly to the Cardholder. Alive Tokens will always have a high demand for exchange. And here are some other reasons besides its utility. As a rule, every three months, Alive’s internal token engineers will burn 5% of all AL codes that a home earns per quarter, reducing the supply of tokens. Alive Casino intends to use an electronic money market analyst who will observe the market and create strategies to convert AL token profits into fiat, taking care to ensure that the value of Token is not negatively affected.